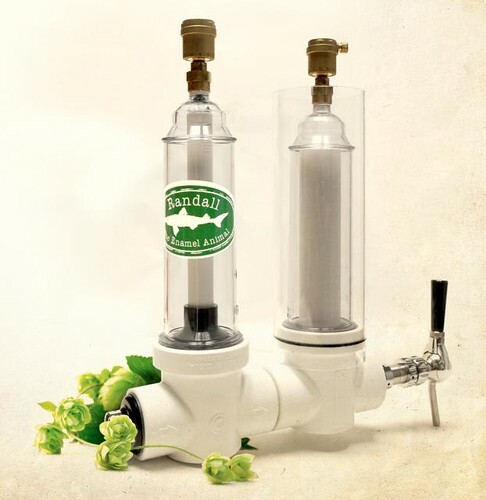 The Randall was first pioneered by the ever-innovative Dogfish Head Brewery in Maryland. Sam Calagione, Dogfish Head’s founder and president, was looking for a way to make his brutally-bitter 120 Minute IPA even more hoppy at an event called the “Lupulin Slam” in 2002 (lupulin is a bitter powder found on hop plants). Sam built a makeshift water filter and filled it with Cascade and Willamette hops before sending the 120 Minute IPA through it. Hopheads at the event were stunned at how fresh and resinous the beer’s hop presence was, even if it did seem like it could strip the enamel off of your teeth. Thus “Randall the Enamel Animal” was born. These days, brewers and homebrewers alike fill Randalls and water filters with much more than just hops. Some common Randall fillers include coffee or vanilla beans, bourbon-soaked oak, fresh fruit, candy canes and jalapeno peppers. Don’t worry: if you can’t afford Dogfish Head’s Randall the Enamel Animal at $375, you can make your own Randall beer filter out of a water filter housing for a fraction of the price. 1. Find an appropriate water filter housing. A standard 10″ water filter housing should work for most applications. You’ll probably want to go with a clear water filter housing, so that you can see whatever ingredients you stuff in it. Since most beer lines are 1/4″, it would make since to find a filter housing that could accommodate 1/4″ lines (rather than using bungs to convert the fittings). Popular outlet sizings on these housings include 1/4″, 1/2″ and 3/4″. Just make sure it either matches the size of your existing line, that you have the appropriate fittings to convert it. The Pentek 158117 Filter Housing is a popular, economical choice. 2. Make a stainless-steel filter replacement. Since a true water filter would diminish the flow you need to move beer through the filter, you’ll want to construct a piece of stainless steel to stand in for the filter. You can drill holes through it to allow for a good flow. Most standard 10″ water filters measure around 2 1/2″ x 9 3/4″. 3. Assemble fittings, tubing, disconnects and other assorted hardware. HopWild gives a good run-down of the various hardware you’ll need to build the Randall, and walks you through the necessary steps. If you liked this post, be sure to come back to read about which water filters to use for homebrewing. If you have any questions about which filter housings would be appropriate, feel free to leave a comment below. A simple solution for a 10″ water filter housing. Unravel a rope type filter. This leaves you with the perfect size filter replacement. The holes in the tube are too big, so just shove a stainless scrubby in the tube. you will have a big ball of string left over to use for whatever you want. Like what you said, I planned to buy a Dogfish Head’s Randall the Enamel Animal, but the price is a little hihg. After reading your post, I plan to make one by myself. The filters pictured above are actually well pump ‘strainers’. The key feature that makes them better than a regular 10″ filter housing is the smaller diameter clear housing that allows space between it and the clear plastic tube that provides an ice shell. This tube is sealed by an o-ring groove cut into the body(black ring in lower right of the pic).